Dr. Schmajuk graduated from the University of Buenos Aires and became an Associate Professor of Biomedical Engineering in Argentina. In 1986, he obtained a doctorate in Psychology from the University of Massachusetts and became a postdoctoral fellow at the Center for Adaptive Systems at Boston University. From 1988 until 1993, he was an assistant professor of psychology at Northwestern University. In 1992 he obtained a fellowship from the Royal Society to develop models of latent inhibition and the hippocampus. In 1993 he moved to Duke University where he is a Professor of Psychology and Neuroscience. Professor Schmajuk has developed and tested neural network models of classical conditioning, operant conditioning, animal communication, creativity, spatial learning, cognitive mapping and prepulse inhibition. Using these neural networks he has described the effects of hippocampal, cortical, and cerebellar lesions, as well as the results of the administration of dopaminergic and cholinergic drugs, in different sensory, learning and cognitive paradigms. 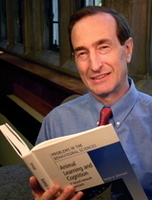 He has published numerous papers and his books include Animal Learning and Cognition: A Neural Network Approach (Cambridge University Press 1997), Occasion Setting. Associative Learning and Cognition in Animals (with Holland, P.C. American Psychological Association, 1998), Latent Inhibition and its Neural Substrates (Kluwer Academic, 2002), Mechanisms in Classical Conditioning: A Computational Approach (Cambridge University Press, 2010), and Computational Models of Conditioning (2010, Cambridge University Press). N.A. Schmajuk (2010). Mechanisms in Classical Conditioning: A Computational Approach.. New York, NY: Cambridge University Press. N.A. Schmajuk (2002). Latent Inhibition and Its Neural Substrates: From Animal Experiments to Schizophrenia.. Norwell, MA: Kluwer Academic. N.A. Schmajuk (1997). Animal Learning and Cognition: A neural network approach.. New York, NY: Cambridge University Press.